1452 Bear Creek is located on the North end of Bishop. This highly desired neighborhood is just outside the city limits, and you will often see your neighbors out walking with their families and pets. This 4 bedroom 2.5 bath home offers a spacious floor plan with the living room, separate den, and formal dining area on the main floor. On the 2nd floor you have the 3 guest bedrooms, guest bath and the master bed and bathroom. Tiled entry, wood laminate floors throughout the downstairs; carpeted throughout the upstairs. 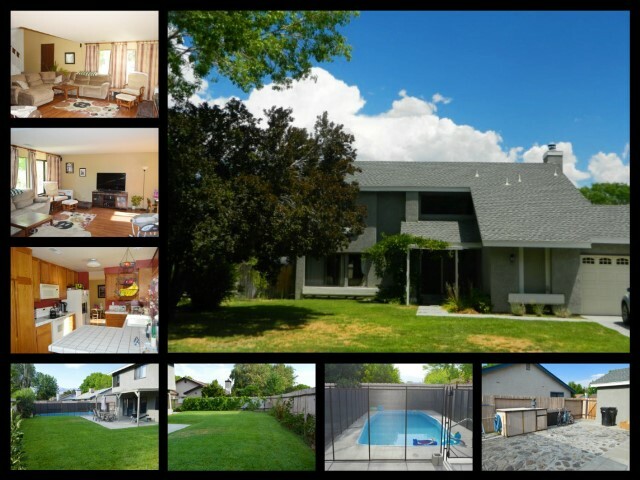 This home offers a fully landscaped yard with automatic sprinklers. Exiting through the back sliding glass doors you have a covered patio, uncovered patio area and in ground swimming pool, with safety fence installed for those hot summer days. This home is walking distance to open DWP land with walking, running or bike paths.